Hazar Imam attends Commonwealth Day in London, U.K. 2019-03-11 | Ismaili.NET - Heritage F.I.E.L.D. Hazar Imam attended Commonwealth Day at Westminster Abbey, London today March 11, 2019. In attendance also were dignitaries from all Commonwealth countries and the British Royal Family. Hazar Imam's family also attended including Princess Zahra, Prince Rahim and Princess Salwa. The Commonwealth represents 53 countries and almost 2.4 billion people and 2019 marks the 70th anniversary of the modern Commonwealth, enabling cooperation towards social, political and economic development. In her message released ahead of Commonwealth Day, the head of state has praised how the family of nations inspires its member states to find ways of protecting the planet and its citizens. Millions of people are 'drawn together' because of the collective values shared by the institution, the Queen said in her address to the countries of the Commonwealth. The written message was featured in the order of service for the annual Commonwealth Day service and was seen to hail the value of international co-operation in what is likely to be interpreted as another royal remark on Brexit. The Queen, who has been the Head of the Commonwealth, throughout her reign, said: 'In April last year, I welcomed the leaders of our 53 nations to Buckingham Palace and Windsor Castle for the Commonwealth Heads of Government Meeting, and we all witnessed how the Commonwealth vision offers hope, and inspires us to find ways of protecting our planet, and our people. The Prime Minister made a bold statement in a blue patterned coat and coordinated hat and heels, as she tackled the cobbles during her arrival - and finished the look with a gold cuff and colourful pebble necklace. Meanwhile, the Queen and Camilla, 71, both donned a similar deep purple ensemble with matching statement hats and pearl accessories for the service. The Queen's rich purple coat and dress with velvet trimming was by Angela Kelly, which she completed with an Amethyst shield brooch, while Camilla opted for a Bruce Oldfield suit and Philip Treacy hat. Commonwealth Day has a special significance this year, as 2019 marks the 70th anniversary of the modern Commonwealth - a global network of 53 countries and almost 2.4 billion people. The theme for this year's service was 'A Connected Commonwealth' which highlights the co-operation between the culturally diverse family of nations who work together in friendship. The beautiful bright flowers which adorned the Abbey represent the 53 Commonwealth nations, while female British Mauritian dancers based in London who enjoy performing Sega, a joyful and lively expression of the Mauritian way of life, performed outside the Abbey ahead of the royal arrivals. 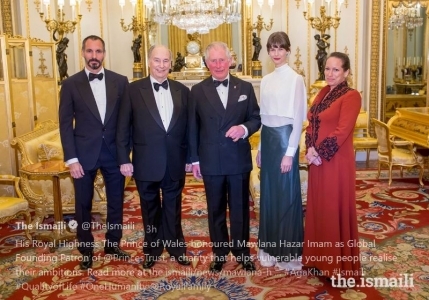 London, March 13 The Aga Khan, the 49th hereditary Imam of the Ismaili sect of Shia Muslims, has been named the Global Founding Patron of the Prince of Wales's charitable trust. The Aga Khan, who also heads the Aga Khan Development Network, will now support the delivery of the work of The Prince's Trust in Canada, Australia, New Zealand and through local partners in India, Jordan, Pakistan, Malta, Barbados and Greece, the trust said in a statement.